The other day, a friend gave me the new Mara Hoffman for Sephora Kaleidoscope Lip Gloss Set. Mara Hoffman is known primarily for her uber-breezy fashion collection: easy pieces with summery prints and type-B attitude. Via text, I warned her that beyond the comprehension of science and reason, we were going to arrive early. "It's never happened before," I was too embarrassed to say. We arrived to her neighborhood, and I could not find her home to save humanity. I have a pest of a temper; thankfully my eruptions usually blow over immediately (and virtually completely) after any bitter outburst. I swore a little, and that's big - I don't swear much. you just need thoughtful friends, an easy attitude, and a little lip gloss. Part of the frustration was, ironically, disappointment in my own self. Nobody is early to meet other moms. It's rude, and I know it. They're not ready yet. They're just busting out of their 90-second shower (only the important parts on busy days! ), or feeding some child or some pet, or finishing up a cable company customer service call while making lasagna AND doing a floor puzzle with their 3-year-old with their foot. They don't have time for your unwelcome overture of punctuality. In fact the opposite is true: your promptness is highly discouraged. Moms want you to be 5-10 minutes late so they can dump the last bit of Parmesan on their magnum opus and find that last pink puzzle piece with their toes, while finishing up fun phone times with Optimum Cable. On another note, there are times when you just have to take it as easy-breezy as a Mara Hoffman top. Thankfully my friend was this way when my giant crew arrived early, and after my little tiny little fit (which thankfully she did not witness), I felt nice and summery too. So she hands me the lip gloss box. A kind and generous move, because I adore trying new beauty products. As some of you readers may know, I have the brain of a collector (Virgo!) and if there is a type of thing I like that I have some of, I can't rest until I neatly and completely have all of them. "I'm keeping my favorite color and giving you these four!" She said sweetly. My brain was churning over how to dig into this adorable set and give a full-blown blog review with that one gloss missing. I'm a liiiiiiiittle nutty. ...and of course, it was only days until I was at Sephora testing the "missing color". Because, I realize that I'm crazy, and that need it all, and I'm OK with that. I have my passions, and I go full force, 100%. It's how I was made, and I can't help who I am. I started thinking about how I would write about these little pretties. But then I got home realized that at Sephora, I had swatched the wrong "missing" color. I took a minute to check myself and re-examine my "full force" approach. Yes, passions are important, but sometimes its useful to realize you have gone a little batty, just maybe, and you need to take a chill pill and be breezy: kind of like the way it feels to put on a Mara Hoffman top, right? Here is Jasper, for the second time... *sigh*. 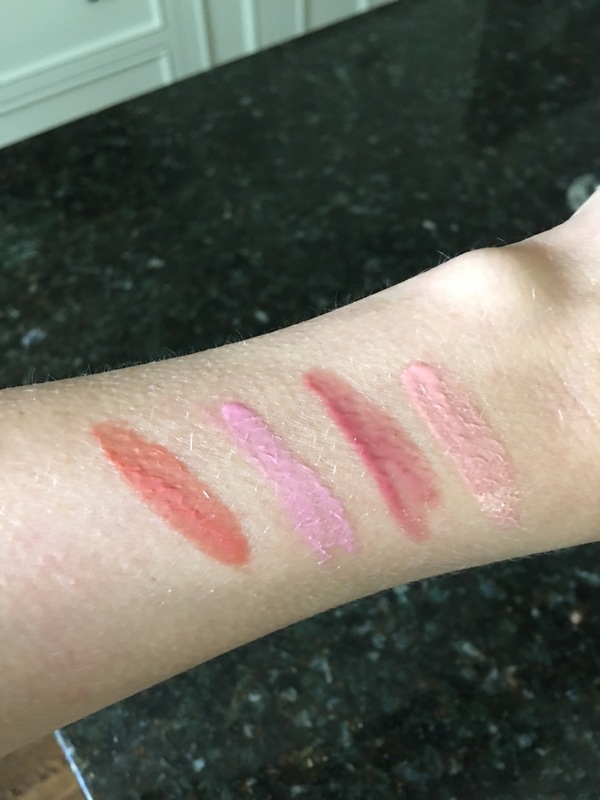 The glosses were thick but not too sticky, soft and moisturizing, and the colors were bright and reasonably deep for a gloss product, although not fully rife with pigment. The adorable packaging is fun and fresh. And you don't need 5. If you get this set, give some away, just for the smiles. The bottom line is that you don't need to have it all. You just need to have thoughtful friends, an easy attitude, and a little lip gloss.